A town quite unlike any other in India, that we are lucky to call home. Pondicherry is where Raff was conceptualised and born, and we have a special connection to the Franco-Tamil town. 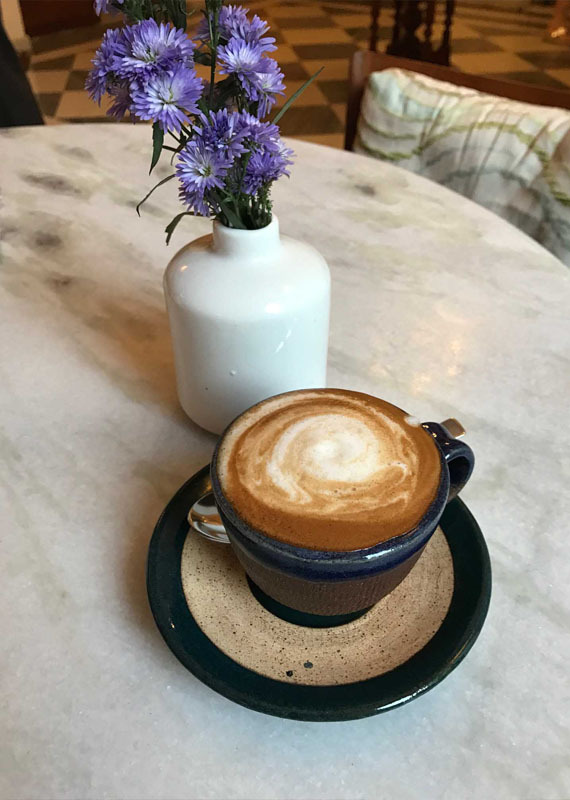 After shedding light on its unique architecture, we share our personal favourite places to eat or have a coffee, including what to order, in Pondicherry. The list is in no particular order. Be sure to bookmark this page for the next time you are in the city! 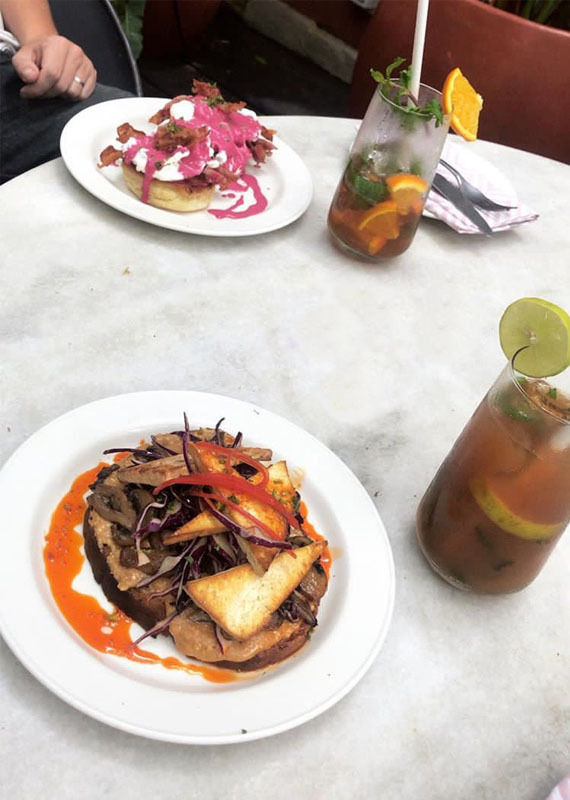 If you’re looking for a quiet spot to get some breakfast or brunch, we suggest Artika. A lush green passageway leads to this pretty patio, serving French breakfast and lunch. 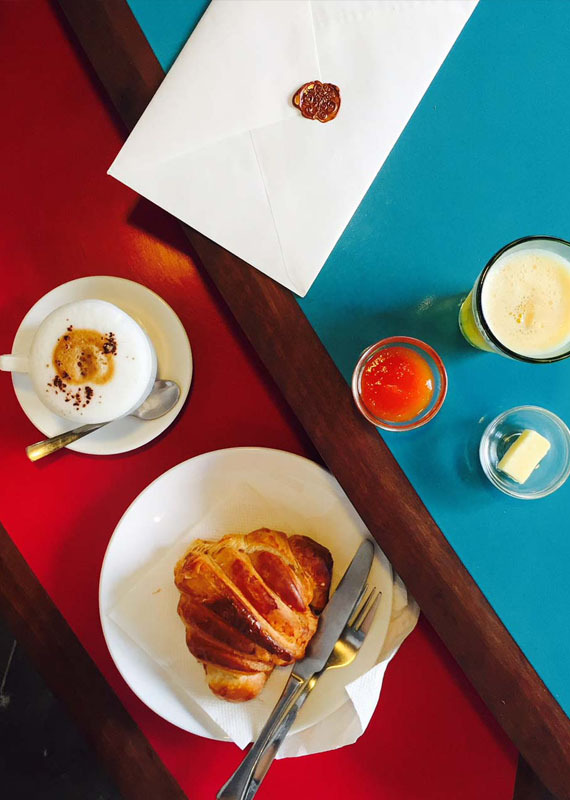 Our favourite picks off the menu is the Mini Breakfast, which is a buttery croissant, coffee of choice and a juice. 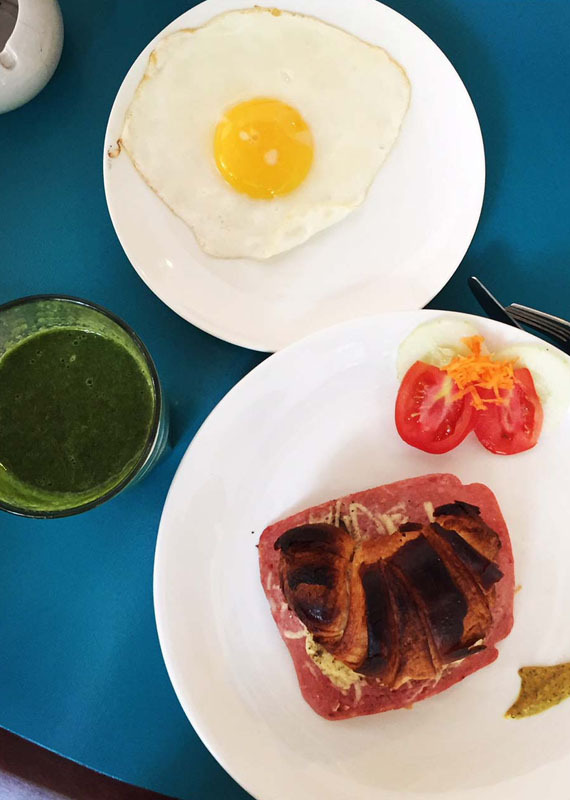 For lunch, we always go for the Ham and Cheese Croissant or the Tuna Rice Salad, with a Green Smoothie. There is also free wifi if you want to catch up on some work while sipping your coffee. A new place in town, Coromandel Cafe is quickly becoming our favourite spot to grab a drink in the evening. We love the ambience of the gorgeous patio filled with greenery, perfect for a lazy lunch or to catch up with friends after work. They have the best cocktail menu in town in our opinion, fusing asian flavours with classics. Our picks off the menu are Pink Eggs Benedict and Golden Mushrooms for brunch and the Caramelised and Goats Cheese Pizza for dinner. Follow their Instagram for updates on everyday specials. 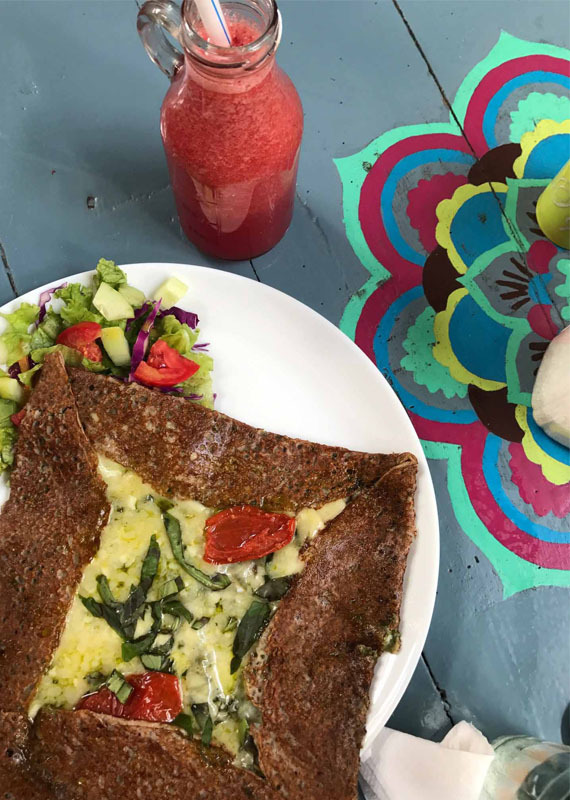 Our favourite spot for lunch, Crepe In Touch offers the best savoury crepes in town. 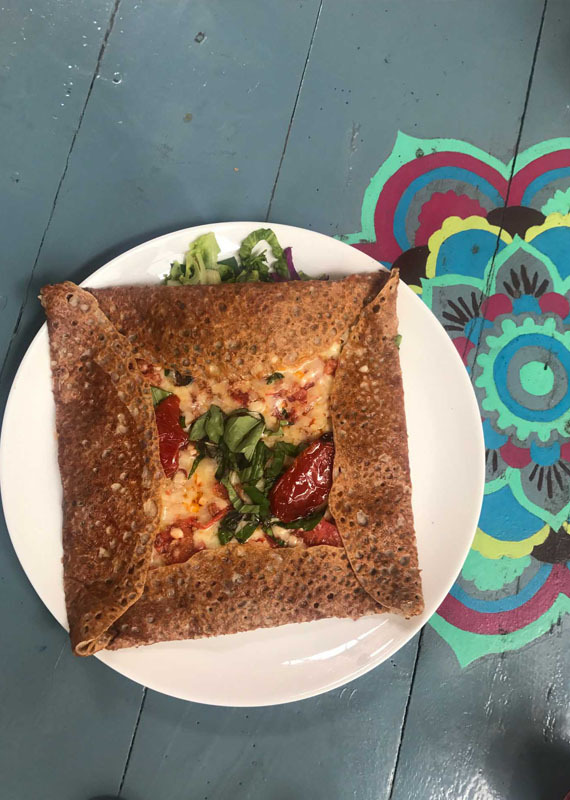 This cozy place in an old Tamil house started by Fanny, who hails from Brittany, serves sweet and savoury crepes made from buckwheat along with salads and other French nibbles. There is a play area for kids and free wifi! Our usual picks are the Saint-Malo, which is with pepperoni, cheese and tomatoes, or for a vegetarian option the Molene which is pesto, tomatoes and cheese. Bread and Chocolate has taken people by a storm, and for good reason! Although it is located on Auroville Main Road and not in town, we had to include it in our list as we feel it’s worth the trip. 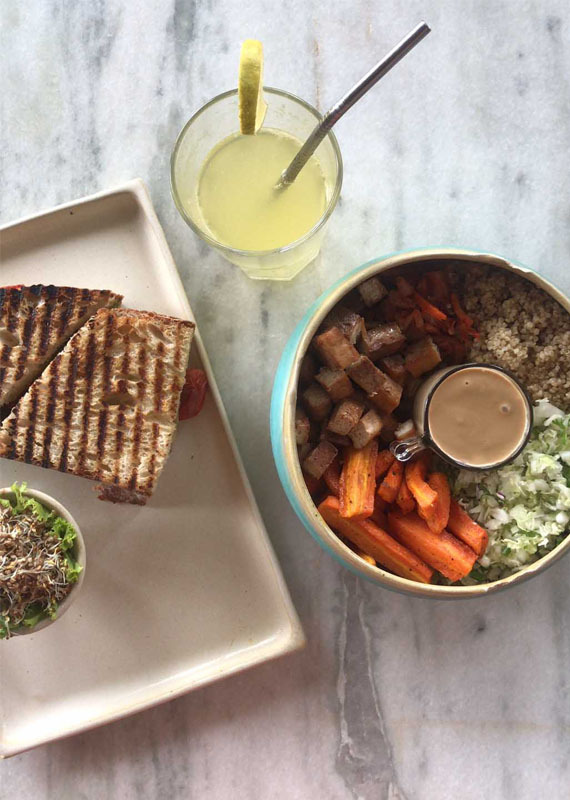 Founded by the owners of Mason and Co. and baker extraordinaire Daniel, Bread and Chocolate is a vegan restaurant serving up delicious sandwiches, smoothie bowls and the best croissant in Auroville/Pondicherry. 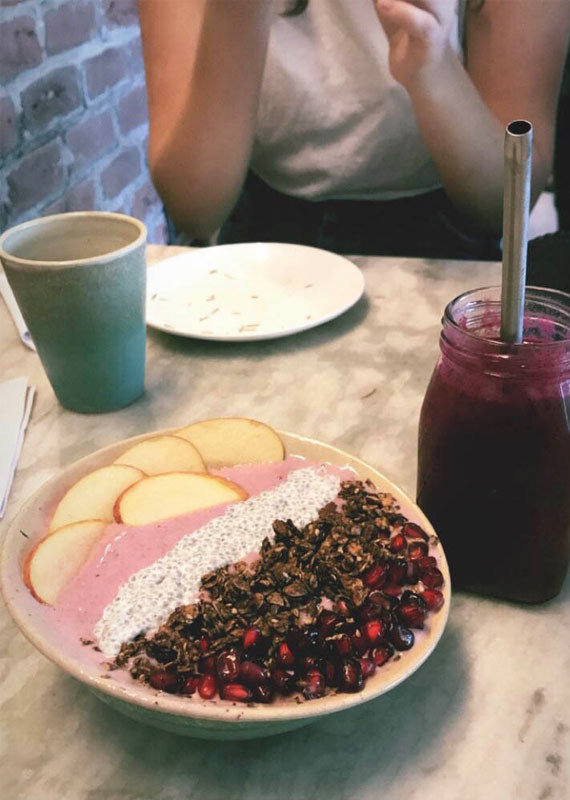 Our absolute favourites off the menu are Hot Pressed Sourdough Sandwiches, Tropical Smoothie Bowl, Abundance Bowls, all the baked goods, Red Velvet Smoothie and Affogato. The lunch menu is only available from 12:00 onwards and the baked goods sell out fast! 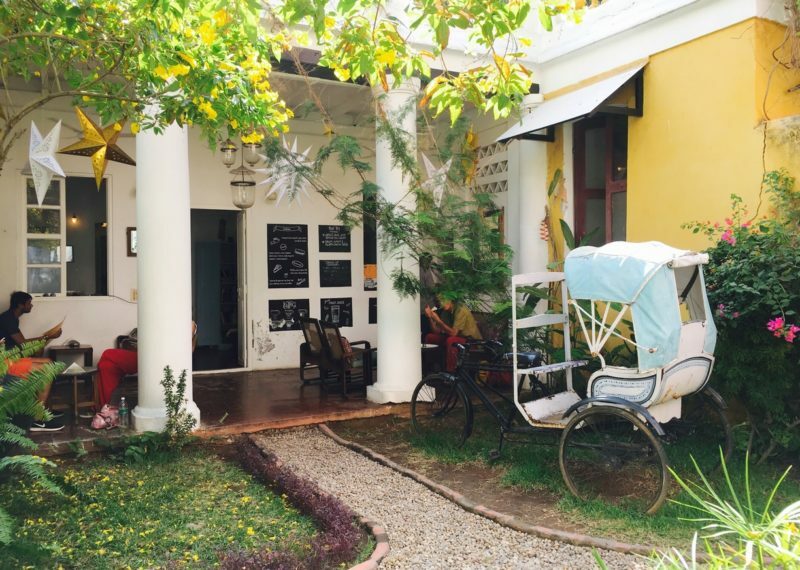 Another new offering in Pondicherry is PY Cafe. A truly Instgrammable cafe, it’s a cute spot if you’re looking to beat the Pondi heat. 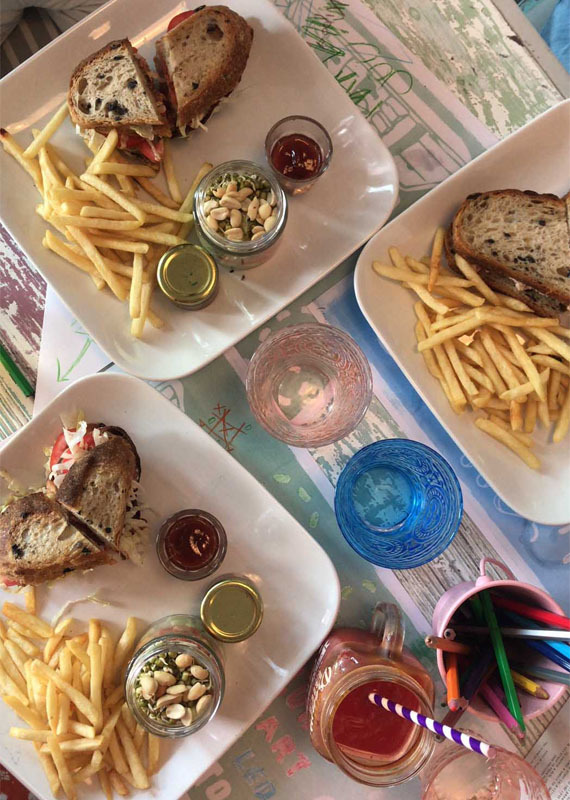 We love their BLT sandwich, made with Auroville bread of the day, and in our opinion is the best in town. We also love their Cold Brew Coffee and Coolers. They also stock gelato from Gelato Factory in Auroville which is a perfect dessert option. Located in the garden of a gorgeous 19th century colonial mansion, La Villa is a perfect place for a date or a quiet dinner. With a lovely French menu, excellent service and a tranquil ambience, this place is a must visit. Our favourites are Smoked Fish Carpaccio, Crispy Fried Prawn, Thai Inspiration Noodles and Grey Snapper. Alcohol is currently only served on weekends. 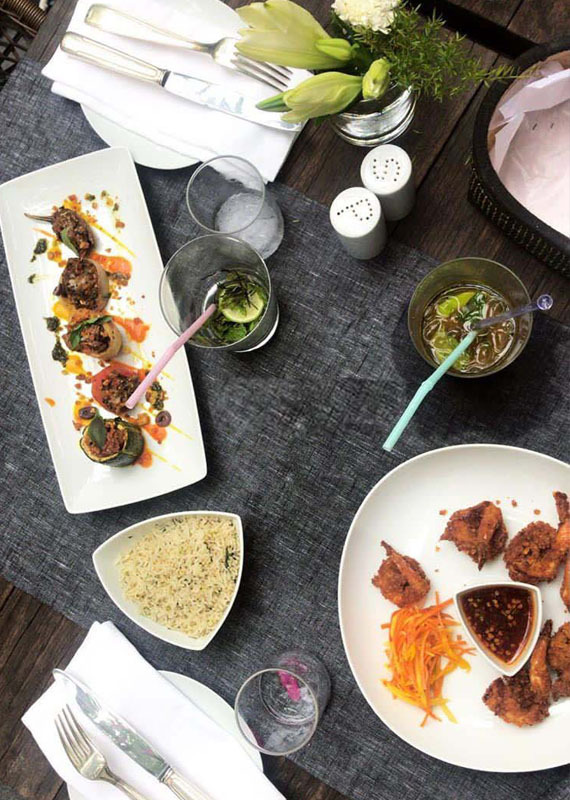 The beautiful French colonial mansion turned into a boutique hotel, Palais de Mahe’s restaurant Les Alize offers an array of European and South Indian cuisine with an extensive cocktail and wine menu. The prawn or fish curry with appams is a must have. The Earth Cafe in the courtyard is often overlooked but serves amazing coffee with a small menu if you wish to grab a bite. Cafe Des Arts is wildly popular, and even more so is the graffiti that graces its outer wall. 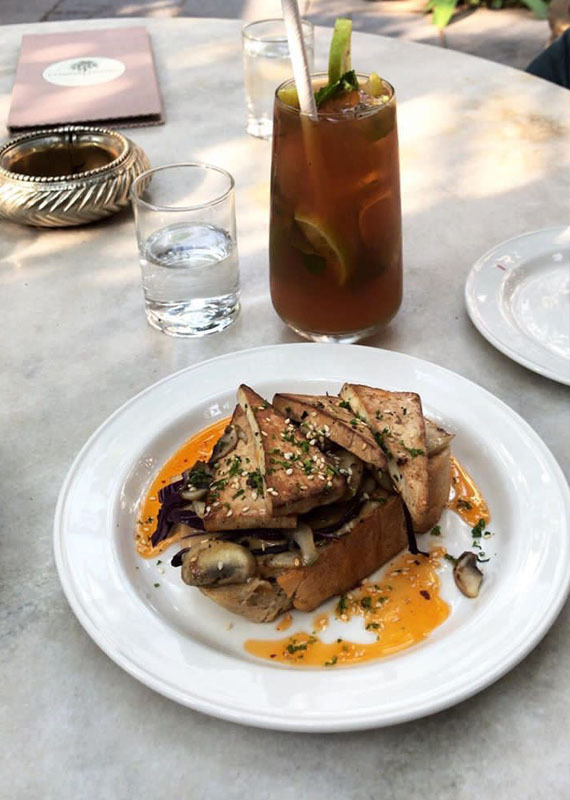 Owned by Eva, Cafe des Arts is our pick to grab a quick drink and a bite, while running errands. We love the ambience and the decor with relaxed seating and a library. Our must haves are the Tartines, Nutella & Banana Crepe and Thai Cold Coffee. Look out for Raff Jewellery in their cute vintage shop! All images are ours, unless mentioned otherwise.